Sunday Morning: 10:30am – All are welcome! We come from all backgrounds and ages. You are welcome to come in your Sunday best or just come as you are. We sing traditional and contemporary music. We share prayer concerns and celebrate communion every Sunday. Children have programs during the worship service, but join worship for communion to be with their families. The Bridge: The Bridge is meeting at 6pm on Thursday, June 8th at Gwinwood Campgrounds in Lacey; 6015 30th Ave. SE. Here’s a link. We’ll share music, fellowship and a potluck meal. Join us! Disciple Women’s Ministries: a conduit for diverse connections empowering each woman to find her voice and live out her call. 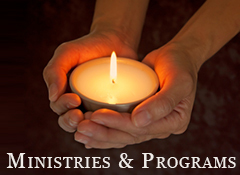 Special Services: We offer special services during Christmas, Lent, and Easter and participate with other Olympia faith groups for special services. We began Lent with our joint Ash Wednesday service with Emmaus Catholic Community, The United Churches, and Westminster Presbyterian. We will have a Maundy Thursday service on April 13th and a Good Friday Prayer Walk at 4pm on Friday, April 14th. We’ll have our Easter Sunrise service at 7:30 am at the Gwinwood Camp & Conference center in Lacey. Before our usual 10am service on Easter, we’ll have an Easter breakfast. More info about each of these special services is on our calendar page. PRIDE ’17 – Once again, FCC-OLY will be in the PRIDE parade and have a booth! Come on out on Saturday, June 17th and march with us, or wave to us as we go by! We’ll have our usual booth and offer ice cold water to anyone who needs a place to cool down and refresh themselves. ALL are Welcome! Prayer Shawl Ministry: The Sew Crafty group hand-crafts shawls to give to those in our community experiencing life trauma. Nesting churches: Our building is a church home to Emmaus Catholic Community and Pacific Island Family Church.